If you find it cute that your little German Shepherd puppy is biting your hand, think again! GSDs grow-up to become strong and muscular dogs. If you encourage them when they bite or make ‘aww’ sounds, it will adopt biting as a habit. However, once a GS pup grows, its biting habits are not cute at all. Trust me on this one. Why is My German Shepherd Puppy Biting and Nipping? Little pups that bite on hands or chew on toys are doing so because they are developing teeth. They chew on toys because their gums feel irritated and to make the pain go away, they bite and chew on things. This behavior during the teething period is very normal and not much of a problem. However, if a GS pup doesn’t leave its biting habit behind when it has grown into an adult, it becomes a huge problem for everyone. Another reason that GSDs bite a lot is that they did not receive proper training as pups. When people start to appreciate or encourage GS biting or nipping, they are making it develop this into a habit. Your dog will start to bite at visitors and household items. This is a problem that needs to be controlled right away or else someone will end up getting hurt. If you let your GS bite and nip, you are letting it take over. Biting and nipping is also a play game for GSD pups. They like to bite other pups in the litter, and this is usually harmless. However, when a pup gets hurt unintentionally, it makes a loud sound. This sound is an indication for the pup that it is hurt, and it is time to stop. How to Stop a German Shepherd from Biting and Nipping? There are several ways you can train your pup not to bite or nip. If your pup is biting because of teething, it is not a problem. However, if your pup’s biting habit is getting out of control, adopt the following strategies to get control over it. The first step is to tell your dog that biting is not acceptable. You will do this with the help of voice commands, body language, and hand signals. If your pup bites at you, make and ‘ouch’ sound. Move away from your pup and stop playing. When you stop playing with your pup the moment it bites, it will associate no play with biting. Repeat this practice whenever your GSD bites or nips. 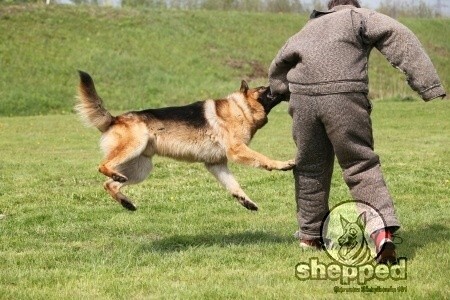 It will help your GSD learn that biting and nipping is not appreciated. Start playing with your pup. Let it grab your hand and as soon as the pup bites, say ‘No’ in an authoritative tone. Put your thumb in your pup’s mouth and under its tongue. Put your other finger lightly beneath its chin. Your pup will not be able to bite you and in this uncomfortable situation, it will try to get your fingers out of its mouth. This is an effective technique that will make the puppy feel uncomfortable and it will avoid biting you. Remember, you will have to repeat this technique several times until your pup completely hates taking your hand in its mouth. If you are playing with your pup and it starts biting your hands, say ‘No’ immediately. Pull your hand backward and pinch your pup in the neck. Do not pinch too tightly. This will make the pup associate pinching with No, and it will soon stop biting you. If you are trying to train your dog to behave and stop biting and nipping, make sure you are doing it with consistency and repetition. 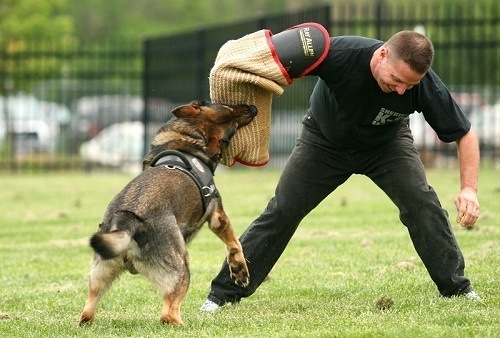 While training a GSD, you will need to repeat your technique several times until it starts to learn. Your GSD needs to know that biting and nipping is not acceptable and will upset you. You will also need to become the leader of your dog, not a friend of the same level. When you are a leader, you control the dog’s behavior. When the dog accepts you as a leader, it starts to follow the rules you set and the commands you give. Do not let your puppy bite on your hands during the training process. Doing so will create confusion in your dog’s mind, and it will not be able to learn that biting is not good. If your dog is doing well and following your orders, do not forget to offer it a treat. 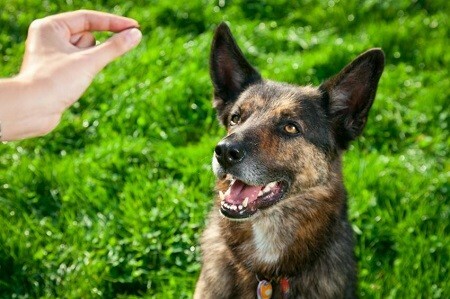 Food treats are a kind of reward that you offer your dog only when it learns something. Make sure you have enough treats with you when you are training your pup. When your pup stops biting you on your ‘No’ command, offer it a treat. This way your GSD will learn that no biting means a yummy treat. In the later stages of your pup’s training, you can replace treats with cuddles or anything that appreciates your puppy. Many troubled owners visit GSD training centers to get rid of their dog’s biting behavior. However, if they adopt effective obedience training strategies, they will be able to control their dog’s behavior. Do not let your pup’s biting habits turn to concrete. A little pup’s biting and nipping is likable, but as soon as it grows into a muscular dog, its biting will cause injuries. 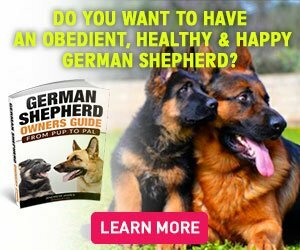 If you need any help regarding your GSD’s behavior and habits, read on to our complete package of GSD guide for amateurs. You can also sign-up for our newsletter to get an expert opinion on GSD behaviors.